It’s a familiar scene: Syria Civil Defence, also known as the “White Helmets,” rushing to rescue a man covered in rubble, but unlike thousands of other videos from Aleppo, this one is staged. “This video and the related posts were recorded by RFS media with Syria Civil Defence volunteers, who hoped to create a connection between the horror of Syria and the outside world using the viral ‘Mannequin challenge.’ This was an error of judgment, and we apologize on behalf of the volunteers involved,” the statement read. Would CNN Have Covered “White Helmet” Deceit Without Alternative Media’s Coverage? Of course, the alternative media has been exposing the “White Helmets” for years as perhaps one of the largest, most complex war propaganda operations conceived thus far by Western powers in their bid to sway public opinion amid regime change efforts in Syria. Image: RSF’s “apology” lacks conviction, but is full of excuses and blame. When the recent “mannequin challenge” video was uploaded, it was the alternative media that caught it, reported on it, and brought viral attention to it. 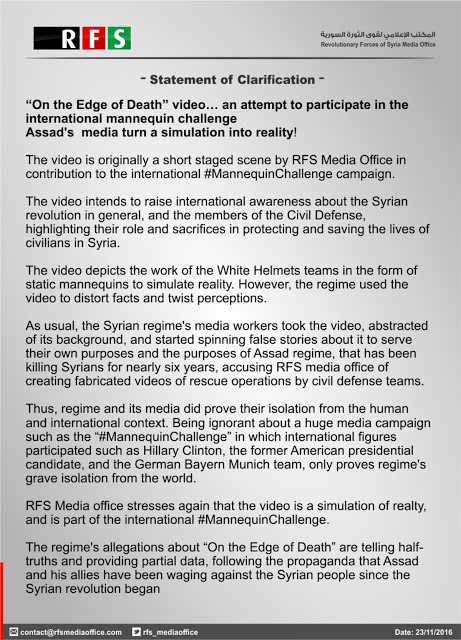 It was the alternative media that exposed the fact that a supposed “rescue organization” was staging fake videos for war propaganda value – in possible violation of the Geneva Conventions, and certainly in violation of basic ethical concerns. It was only after the alternative media raised these concerns and cornered RFS and the “White Helmets” that establishment media platforms like CNN finally reacted to a story it likely would have otherwise ignored. It is no wonder, then, why establishment media platforms like CNN, the Washington Post, and others are so passionately opposed to the alternative media – they are no longer setting the agenda, and are instead forced to react. Real journalism equates to reporting and honestly analyzing world events rather than contriving and spinning them – for CNN and others, they no longer possess the freedom to do the latter without consequence. For the alternative media, successes like this, and the fact that establishment Western media has all but declared war on the alternative media should highlight the value of honest journalism and analysis. It should also be a constant reminder that fact-driven media will always win out over agenda-driven media. For the alternative media to continue to grow and be successful, it must reaffirm its dedication to fact-driven media no matter how tempting it is to do otherwise. Tony Cartalucci, Bangkok-based geopolitical researcher and writer, especially for the online magazine "New Eastern Outlook." I googled CNN and this and there is none of this on there just horrific pictures. Jeez how sick are you people? Need to be stopped this is fake. There should be a law. Must be Russian.